I've been keeping an eye on the spring river following predictions out of the North Central River Forecast Center. They issued new predictions on March 1st. I'm curious when they will update it again as we're now getting the first of the spring rains. Here's what I find interesting. Back on February 16th they issued this graph. Now, on March 1st they issued this one. There are some subtle but interesting differences. On the Feb 16th prediction, they estimated the chances of the river reaching minor flood stage (14 feet) to be about 90%. 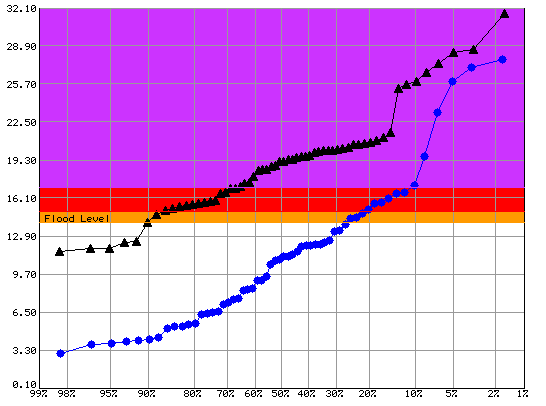 You can see the black line intersects the yellow flood level at the 90% mark in the top graph. The prediction for severe flood level was about 65%. Now look again at the March 1st prediction. The chances of a minor flood have decreased down to about 82%. That's a 9% degrease. Good news right? 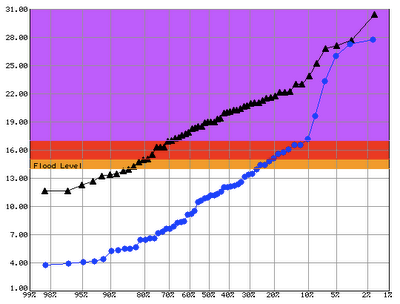 Look at the prediction for moderate and severe flooding though on the new graph. Both have increased slightly. I find it really interesting that the odds of minor flooding have decreased but odds for more severe have increased. I'm guessing there may be a new prediction on Monday the 15th. Well see what happens to the numbers. I'm betting they go up what with the rain but then again an early and slow thaw may actually help decrease chances of flooding.